I’ve received a lot of messages lately as the anniversary of Maddie’s death gets closer. First, it really means so much to me that so many people a) remember and b) reach out. Next Sunday will be ten years since she died, which is obviously a crappy milestone. I’ve been trying my usual technique of keeping myself super-busy with spring cleaning, coaching, work, and school events. It’s helped some, but my other form of coping (writing) has not come easily. I’ve had a serious mental block for quite a while now. I can do my work, but when I sit to write out anything personal I just…can’t. Not even the writing I do for myself. I think my brain is keeping me from “going there” by threatening me with flashbacks and other unpleasant things. The feelings are intense this year and the words just won’t come. I’m hopeful that once the seventh passes I’ll start to feel better, since that’s what usually happens. I’m just going to take it day-to-day for now and try to give myself a pass when I need it. I still put a lot of pressure on myself to “push through,” but I’m working on it. ~At 71, She’s Never Felt Pain or Anxiety. Now Scientists Know Why. ~People Don’t Bribe College Officials to Help Their Kids. They Do It to Help Themselves. ~With age comes ‘Wizdom.’ The Wizards’ 50-and-older dance squad is thrilling crowds. Annie has been playing catcher on our softball rec team and she loves it. She’s been working hard at getting better and I’m really impressed at the effort she’s put in. Yesterday she caught two games and was in her element. After watching Annie’s games, we all went over to the baseball fields for James’ game. There, he told me and the other coaches that he wanted a turn at catcher, “like my sister.” So cute. ~We don’t have spring break here for two! more! weeks! Since we’re staying local over the break, I’m thinking about maybe getting this mini projector to make watching movies at home more fun. I’ve rented a projector so many times that I think maybe we should just pull the trigger and get our own. ~Since I spend four to six days every week coaching, I spend a lot of time in workout leggings. I don’t know if I’ve linked to these before but I am going to wax on about these leggings that have tummy control AND SIDE POCKETS. It’s made my life so much easier to have those damn pockets. I have…let’s just say I have several pairs. ~Annie’s softball team is named “Baby Sharks,” and one of my friends gave us this singing shark as a lucky charm. The girls love it and my hope is they will run out the battery inside before the season ends, LOL. I was thinking about Maddie a couple of days ago. I do miss your blog posts but totally understand. Please know that there are a lot of people that were touched by Maddie and she will never be forgotten. Love to you, Mike and kiddos during this tough time. I always think of Maddie this time of year, and of you and Mike. I hope that is a comfort in a small way, that she is remembered. I still make a donation to March of Dimes every year in her honor. I’m sure this is a tough anniversary, sending all my best wishes. I am thinking of you today and sending love and hugs. A total stranger in Boston, who has been so touched by your family’s story. I remember Maddie – her sparkle, her fierceness. I am as sorry she’s not here today as I was when I started reading your blog 10 years ago. It’s still utterly wrong and unfair. She should be here, and writing what I’m going to say next should be unnecessary. As wrong and unfair and cruel as it always will be, though, there is something else I feel reading your blog today that is entirely different from a decade ago. Hope. You and Mike did the near impossible and clawed your way back to LIFE, in memory of and in honor of your incredible daughter. You and Mike and Annie and James keep Maddie alive in the love and joy that is so clearly evident in your family. You help countless others in her name. A family very dear to my heart is only six weeks in to their own journey of losing a child, and right now it is all darkness. And though I wouldn’t say this to them in this moment because it feels dismissive of that darkness, I have a deep belief that, while they will grieve the rest of their lives, they will also feel love and joy again. Because I’ve seen it here. When a family loves each other as completely as you and Mike and Maddie did, that love doesn’t vanish when someone is gone. In fact, as you have proven … it multiplies. Thinking of your sweet family today. Especially beautiful Maddie? That wasn’t supposed to be a question mark. So sorry. Should have been a heart. Heather, your blog was the very first I ever read. I have a son who is Maddies age, and I started reading your blog right after she passed. So through the years I have gone and read posts, looked at pictures and videos of her. Though we don’t know eachother, I have always felt connected and have rooted for you the entire wsy. 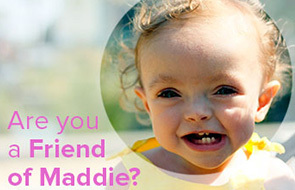 My whole family knows about Maddie, and my husband and kids often will ask how “Maddies Mom” is doing. You are truly cared for and loved by so many. Darn! Those were supposed to be purple hearts!